Denis Villeneuve, the French-Canadian director of Prisoners (2013), Sicario (2015) and Arrival (2016), may not be the most decorated director, but it is undoubtedly easy to see his name among the great directors of our time. In every one of his movies, he exploits the vulnerabilities of humanity– Prisoners (2013) exploits the love a parent holds for its child, and Arrival (2016) exploits our opposition to things we don’t understand, calling for a dose of perspective. His ability to critique humanity while also conjuring hope for future generations is what makes Blade Runner 2049 the epic that it is. The movie deals with the humanity of artificial intelligence, as oxymoronic as that sounds. I often felt as if the Replicants, the human-made robotic slaves in the Blade Runner world, expressed more emotions than the humans. The humans were focused on control and power, whereas the Replicants were focused on coming to terms with their own emotions and drives, attempting to convince the humans that they were, indeed, human. This dynamic added depth to the question, “What does it mean to be human?” as the Replicants seemed to understand humanity better than the humans at times. 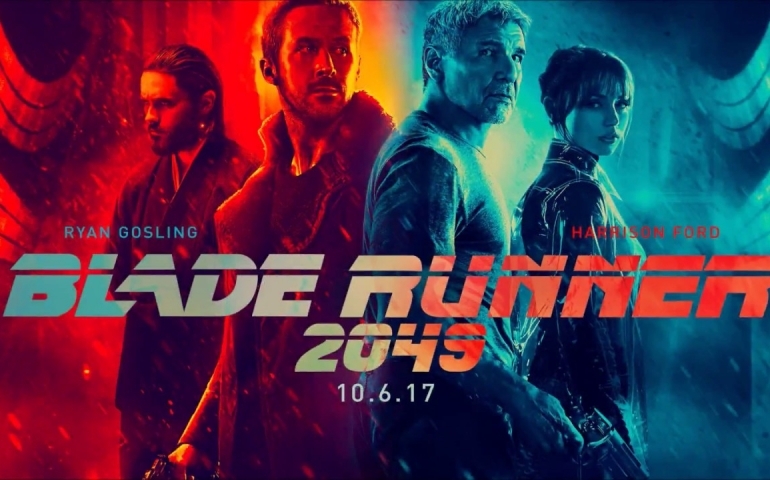 The score only furthered the plot, as Hans Zimmer and Benjamin Wallfisch managed to modernize the ethereal synthesizer of the original Blade Runner. Although this movie has a run time of 2 hours and 43 minutes, I never felt bored or tired– even in the moments with little dialogue or action, I felt engaged with the plot due to the subtleties of the score. The score evoked deep emotion in powerful scenes and helped capture the humanity in simple scenes. The final aspect of the film that stood out to me was the cinematography. Not only was the acting, directing and scoring near-perfection, Roger Deakins’ camerawork in this film was stunning. He captured an immersive world full of both darkness and color, utilizing long takes and stark black and white contrasts. This allowed the viewer to feel as if they were a part of the Blade Runner world while also capturing the subtleties in tone shifts and emotions, creating the perfect addition to this already near-perfect movie. Between the many wonderful things about this movie, there are many different aspects that will appeal to the vast majority of people. Even if you haven’t seen the original Blade Runner (although I would recommend it), Blade Runner 2049 holds as a stand-alone movie, so there is no imminent need to watch it beforehand. This movie will go down in history as one of the greatest of all time, so don’t waste another moment– go see it on the big screen while you can.